Why don’t more African-Americans ride bicycles? Denver City Councilman Albus Brooks, right, in Copenhagen with Downtown Denver Partnership Director Tami Door. It took a week in Copenhagen for Albus Brooks to start thinking seriously about bicycling. The Denver city councilman, 35, had never owned a bike. By the time he headed home from a study tour in Denmark last month, he knew those days were over. So Brooks came home and bought his first bicycle, a Danish-style city bike. When he rode it to a meeting of other African-American community leaders, eager to spread his conclusion that bike transportation could be as important as mass transit to improving central Denver, he got a first-hand lesson in the size of the task he had decided to tackle. Bicycles are and have been part of the African-American experience for decades. In 2006-2010, Census figures show that 221,670 Americans of color, probably about a quarter of them Black, got to work mostly by bicycle. Bike use by African-Americans doubled from 2001 to 2009, five times faster than the growth of biking among white Americans. Even so, African-Americans as a group bike less than one might expect. Black people are disproportionately likely to live in older cities with connected street grids; they are disproportionately likely to live in poverty; and African-American householders are twice as likely as other householders to live without a car. (About 20 percent of Black householders don’t own a motor vehicle.) All these factors tend to increase bike transportation. But among African-Americans, the connection seems to be weaker. In a provocative, persuasive CityLab article last week, two American University scholars shared another finding: compared to people of other races in a local survey, African-American people were more likely to say they prefer getting around in a car. The above data comes from the first year of the same American University survey of 260 commuters from Washington D.C.’s overwhelmingly African-American wards 7 and 8. It was provided by study co-author Adam Jahav. In many ways, it looks like the same list you might get from people of any background. Percieved danger, the number-one reason not to bike? Sounds familiar. Distances too far? Even Dutch people drive for most trips of two miles or more. Cold and sweat? Every bicycle user in history can relate. Many of the reasons so few African-Americans bike for transportation are exactly the same as the reasons so few Americans do: uncomfortable streets, sprawling cities, scorching summers, a national culture that sees bike transportation as odd. But other reasons, at least among low-income African-Americans, are not the same. Useful and troubling as these findings are, especially the last, take them with a grain of salt; as the charts suggest, the findings for African-Americans here are based on exactly seven people. Still, the CCC study is a powerful reminder of how many different ways there are to be put off biking — and how many very different factors we’re collapsing into a single dimension when we say that bike transportation “isn’t desirable” to someone. For Brooks, the Denver councilman, there’s no question that many Black people ride bicycles. But among his own middle-class peers, Brooks detects a sense that biking is something you do only if you must. “These are people who don’t really see biking as an advantage for getting around downtown, or an economic advantage, or an advantage for health,” Brooks said. In his 2014 book Dead End, a political history of the American suburb, Maryland transit advocate Ben Ross shares an intriguing theory of why the American “love affair with the automobile” began to fracture: cars became common. Only after it became “normal” to have a car, Ross argues — around 1960 in the United States — could it become thinkable to choose not to have one. The automobile, once a luxury and now a necessity, suffered the same loss of status as the lawn. … In time, the altered values led to changes in behavior. The miles Americans drive, after rising steadily for a half-century with only brief interruptions for recessions and gasoline price spikes, leveled off. … For a sizable minority of young adults in the new millennium, living without an automobile ceased to carry shame. But for many African-American communities, the story of the last 50 years has been different. When one in five Black householders doesn’t own a car, it’s easy to see how carlessness can be a badge of poverty, and therefore shame, among rich and poor alike. 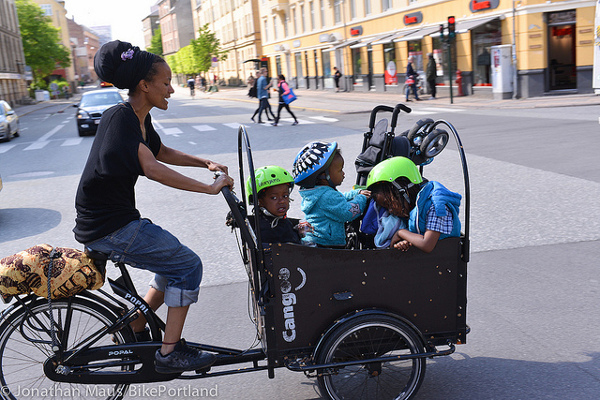 Can cities fighting to become less car-dependent chip away at the problems that keep so many African-Americans off bicycles? Can Brooks and the many other African-American politicians trying to boost biking — straight up to U.S. Transportation Secretary Anthony Foxx — sell the idea to skeptics? 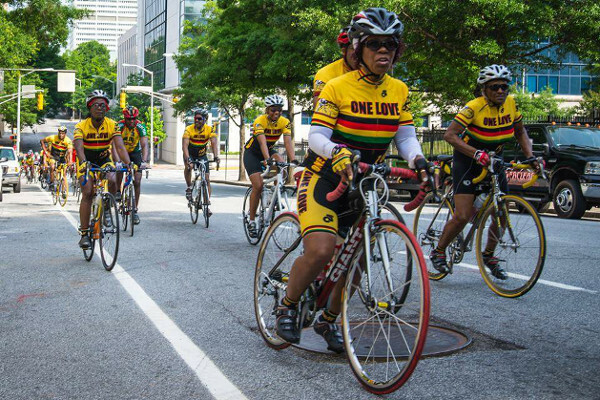 Through it all, will the number of African-Americans who are riding bikes keep growing fast? Here at Green Lane Project HQ, we’re kicking off a project that we hope can be part of the solution. For the next three months, we’ll be building on the inspiring work of our friends at the League of American Bicyclists to create a report that looks squarely at the wedges between marginalized Americans, the African-American community included, and the protected bicycle infrastructure we support. We’ll show how grasstops leaders are building coalitions for better biking and grassroots activists are winning arguments for safer streets in long-neglected neighborhoods. We’ll share the most up-to-date research that leads us to believe modern, protected bike infrastructure can be good for everyone. And we’ll also identify some of the ways the interests of people with more privileges are different from people with less. This is the first post of a series in which we’ll be sharing different aspects of this project as we go along. Do you have a perspective that should inform our report? Can you share a story that helps our country understand the complicated connections between class, race, income and transportation? We want to hear them. I’m [email protected] Let’s talk. Update: here’s another blog post we compiled of reactions to this one, and here’s the report we wrote after talking to these and many other people about this and related questions.